I received my PhD in linguistics at the Ohio State University in 2004, working with Elizabeth Hume. From 2004 to 2006, I was a postdoc in the Arizona Phonological Imaging Laboratory (APIL), directed by Diana Archangeli. From 2006 to 2012 I worked as an assistant and then associate professor in the Linguistics Department at the University of Ottawa, before joining the linguistics program in the English department at NCSU in the fall of 2012. I study linguistic sound patterns using laboratory and computational techniques. Sound patterns are of interest because they are fundamentally arbitrary, so they are a good testing ground for studying the interaction of physiological, cognitive, social, and other factors. Different sound patterns reflect these influences to different degrees. Currently I am especially interested in covert articulatory differences and how these relate to linguistic variation and change. I am also interested in segmental phonology, and the use of distinctive features to model it, as well as idiosyncratic phonological patterns, such as English /r/ allophony, and phonological differences between Autistic and unaffected populations. Visit the Phonology Lab. Phonetic factors and individual differences in the inception of sound change: The development and spread of changes in pronunciation norms provide a valuable opportunity to investigate the interaction of group-level and individual-level factors related to language. One ongoing project concerns a sound change in progress in Canadian French. 1. Automatic transcription and acoustic analysis of two conversational speech corpora housed in the Sociolinguistics Laboratory at the University of Ottawa, tracking the change in 75 speakers of French in Gatineau, Quebec born from 1893 to 1991. 2. Articulatory and acoustic analysis of laboratory speech, using ultrasound imaging to generate real-time video of tongue movements, revealing that rhotic vowels are articulatorily similar to English [r], and show similar inter-speaker articulatory variation. 3. Perception study of rhotic and non-rhotic vowels by English and French speakers in Ottawa, English speakers in Raleigh, and French speakers in Paris (with Jeffrey Lamontagne, University of Ottawa). P-base: P-base is a database of several thousand phonological patterns in 549 languages and multimodal phonetic data on the production of 130 crosslinguistically frequent consonants and vowels. 2018-2019 $5498: Non-laboratory Scholarship/Research Support Program, NCSU, "Vowel quality repository"
2016-2019 $298,330: NSF grant BCS-1562134 (Documenting Endangered Languages), "Phonetic and Phonological Documentation of Kalasha, an endangered Indo-Aryan language"
2015-2018 $379,994: NSF grant BCS-1451475 (Linguistics), "Phonological implications of covert articulatory variation"
2014-2015 $3100: Scholarship and Research Award, NCSU College of Humanities and Social Sciences, "Covert variation in speech production: implications for language change"
2010-2013 $83,000: SSHRC grant #410-2010-0552, "Data Mining Sound Patterns". 2008-2013 $278,099: CFI grant #15834 (with Marc Brunelle) "Sound Patterns Laboratory/Laboratoire des structures sonores"
2009-2012 $6772 from the Royal Canadian Mounted Police for forensic speech corpus. 2007-2010 $68,804: SSHRC grant #410-2007-0735, "Measuring the Phonetic Similarity of Speech Sounds"
2006 $9974: Seed grant, University of Ottawa Faculty of Arts/University Research Committee. Organizer (with Suzanne Curtin, Lyra Magloughlin and Alan Yu), Conference on sources of individual linguistic differences (with special attention to Autism Spectrum Disorders)/Conférence sur les sources des différences linguistiques individuelles (avec attention speciale aux troubles du spectre autistique), University of Ottawa, March 2012. English Pronunciation Seminar (using ultrasound for articulatory feedback), Organized by KOWIN Ottawa at Korean Embassy in Ottawa, 2011. Grand Awards Judge (Behavioral and Social Sciences), Intel International Science and Engineering Fair, Phoenix, 2005. 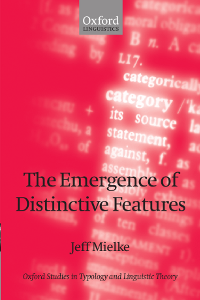 Mielke, Jeff (2008) The Emergence of Distinctive Features. Oxford: Oxford University Press. xviii, 280 p. [reviewed in Language 87:3]. Bridget J. Smith, Jeff Mielke, Lyra Magloughlin, and Eric Wilbanks (accepted) Individual variation and phonological effects of English /ɹ/. Glossa. Mielke, Jeff (2018) Visualizing phonetic segment frequencies with density-equalizing maps. Journal of the International Phonetic Association 48(2):129-154. Jeff Mielke and Kuniko Nielsen (2018) Voice Onset Time in English voiceless stops is affected by following postvocalic liquids and voiceless onsets. Journal of the Acoustical Society of America 144(4):2166–2177. Mielke, Jeff, Christopher Carignan, and Erik R. Thomas (2017) The articulatory dynamics of pre-velar and pre-nasal /æ/-raising in English: an ultrasound study. Journal of the Acoustical Society of America 142(1):332-349. Mielke, Jeff, Adam Baker, and Diana Archangeli (2016) Individual-level contact limits phonological complexity: evidence from bunched and retroflex /ɹ/. Language 92(1):101–140. Mielke, Jeff (2015) An ultrasound study of Canadian French rhotic vowels with polar smoothing spline comparisons. Journal of the Acoustical Society of America 137(5):2858-2869. Cristià, Alejandrina, Jeff Mielke, Robert Daland, and Sharon Peperkamp (2013) Similarity in the generalization of implicitly learned sound patterns. Laboratory Phonology 4.2: 259-285. Mielke, Jeff (2012) A phonetically-based metric of sound similarity. Lingua 122: 145-163. Mielke, Jeff, Kenneth S. Olson, Adam Baker, and Diana Archangeli (2011) Articulation of the Kagayanen interdental approximant: An ultrasound study. Journal of Phonetics 39.3: 403-412. Baker, Adam, Diana Archangeli, and Jeff Mielke (2011) Variability in English s-Retraction Suggests a Solution to the Actuation Problem. Language Variation and Change 23.3. Kenneth S. Olson, Jeff Mielke, Josephine Sanicas-Daguman, Carol Jean Pebley, and Hugh Paterson III (2010) The phonetic status of the (inter)dental approximant. Journal of the International Phonetic Assocation 40.2: 199-215. Mielke, Jeff. Segment Inventories (2009) Blackwell Language and Linguistics Compass 32.3: 700-718. Mielke, Jeff (2005) Ambivalence and ambiguity in laterals and nasals. Phonology 22.2: 169-203. Mielke, Jeff, Mike Armstrong, and Elizabeth Hume (2003) Looking through opacity. Theoretical Linguistics 29.1-2: 123-139. Mielke, Jeff (2003) The Interplay of Speech Perception and Phonology: Experimental Evidence from Turkish. Phonetica 60.3: 208-229. Mielke, Jeff, Erik R. Thomas, Josef Fruehwald, Michael McAuliffe, Morgan Sonderegger, Jane Stuart-Smith, and Robin Dodsworth (2019) Age vectors vs. axes of intraspeaker variation in vowel formants measured automatically from several English speech corpora. International Congress of Phonetic Sciences (ICPhS) 2019. Stuart-Smith, Jane, Morgan Sonderegger, Rachel Macdonald, Jeff Mielke, Michael McAuliffe, and Erik R. Thomas (2019) Large-scale acoustic analysis of dialectal and social factors in English /s/-retraction. International Congress of Phonetic Sciences (ICPhS) 2019. Amanda Eads, Jodi Khater, and Jeff Mielke (2018) Arabic L2 phonological acquisition: An ultrasound study of emphatics and gutturals. In Mohammad Alhawary, editor, The Routledge Handbook of Arabic Second Language Acquisition, pages 93–112. Routledge, New York. Mielke, Jeff (2013) Phonologization and the typology of feature behaviour. In Alan Yu, ed., Origins of sound change: Approaches to phonologization. Oxford: Oxford University Press. Archangeli, Diana, Jeff Mielke, and Douglas Pulleyblank (2012) Greater than noise: Frequency effects in Bantu height harmony. In Bert Botma and Roland Noske, eds., Phonological Explorations: Empirical, Theoretical and Diachronic Issues. Berlin: Mouton de Gruyter. 191-222. Mackie, Scott, and Jeff Mielke (2011) Feature economy in natural, random, and synthetic inventories. In G.N. Clements and Rachid Ridouane, eds., Where do phonological contrasts come from? Cognitive, physical and developmental bases of phonological features. Amsterdam: John Benjamins. 43-63. Mielke, Jeff, Lyra Magloughlin, and Elizabeth Hume (2011) Evaluating the effectiveness of Unified Feature Theory and three other feature systems. Tones and Features: In Honor of G. Nick Clements. Berlin: Mouton de Gruyter. Mielke, Jeff, Adam Baker, and Diana Archangeli (2010) Variability and homogeneity in American English /ɹ/ allophony and /s/ retraction. Variation, Detail, and Representation. (LabPhon 10). Berlin: Mouton de Gruyter. 699-719. Lamontagne, Jeffrey, and Jeff Mielke (2015) Perception of Canadian French rhotic vowels. New Ways of Analyzing Variation (NWAV) 44, Toronto. Mielke, Jeff, Christopher Carignan, and Robin Dodsworth (2014) A study of tongue trajectories for English /æ/ using articulatory signals automatically extracted from lingual ultrasound video. 168th Meeting of the Acoustical Society of America, Indianapolis (special session Findings and Methods in Ultrasound Speech Articulation Tracking). Christopher Carignan, Jeff Mielke, and Robin Dodsworth (2014) Temporal dynamics of /æ/ tensing in North American English: an ultrasound study. Methods in Dialectology XV, Groningen. Mielke, Jeff (2014) Typological and articulatory perspectives on context effects. 3rd Workshop on Sound Change, Berkeley. Mielke, Jeff and Anthony Brohan (2013) Frequent segmental patterns in P-base 3. Invited talk at What is Phonological Typology? workshop, Oxford. Mielke, Jeff, Kuniko Nielsen, and Lyra Magloughlin (2013). Phonetic imitation by individuals with Autism Spectrum Disorders: Investigating the role of procedural and declarative memory. 21st International Congress on Acoustics/165th meeting of the Acoustical Society of America/52nd meeting of the Canadian Acoustical Association, Montreal. Lamontagne, Jeffrey and Jeff Mielke (2013) Perception of Canadian French rhotic vowels. 21st International Congress on Acoustics/165th meeting of the Acoustical Society of America/52nd meeting of the Canadian Acoustical Association, Montreal. Mielke, Jeff (2012) Phonological typologies at the individual level and the language level. Colloquium talk, University of Pennsylvania. Canadian French. New Ways of Analyzing Variation (NWAV) 41, Bloomington. Mielke, Jeff (2010) A feature-learning algorithm. Canadian Linguistics Association, Montreal. Mielke, Jeff (2010) Learning phonological distinctive features. Colloquium talk, Simon Fraser University Applied Math Seminar.